The techniques for obtaining high quality multichannel recordings imply equipments with costs that can reach several thousand euros and are often somewhat large, cumbersome and presuppose a certain degree of logistic organization to be used to the best. Making guerrilla recording with a shoulder strap recorder and boom in hand is not exactly the best way to go unnoticed. For some years now, with the advent of handy recorders, the practice of recording always and everywhere has certainly become more discreet with a compromise between quality and price to be considered excellent. 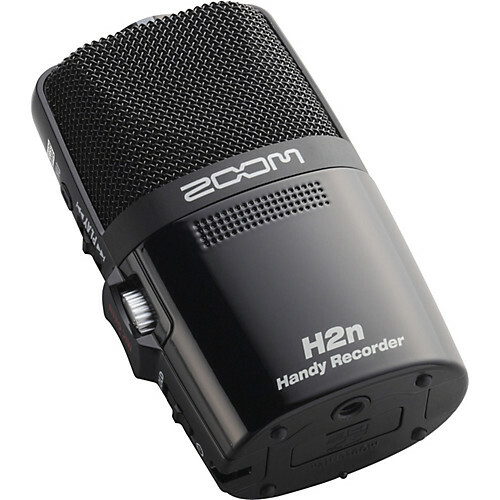 Often, however, these types of recorders are limited to a stereo recording, some models, like the Zoom H6, mount MS capsules giving the possibility to take home a good mono format. But, what if I want to record in surround format? 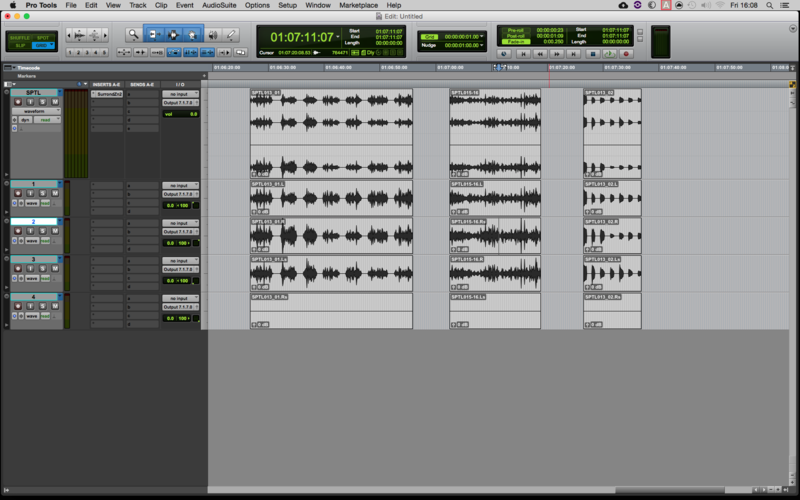 I did a little test with the Zoom H2n to produce 7.0 recordings. Thanks to the new firmware, the spatial recording feature can be accessed. 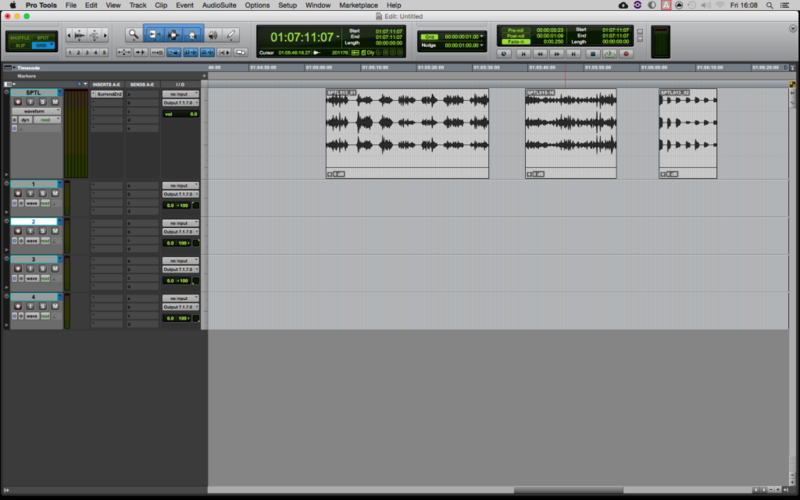 The mics mounted on the small recorder are configured by the software to extract an encoded AMBIX signal. 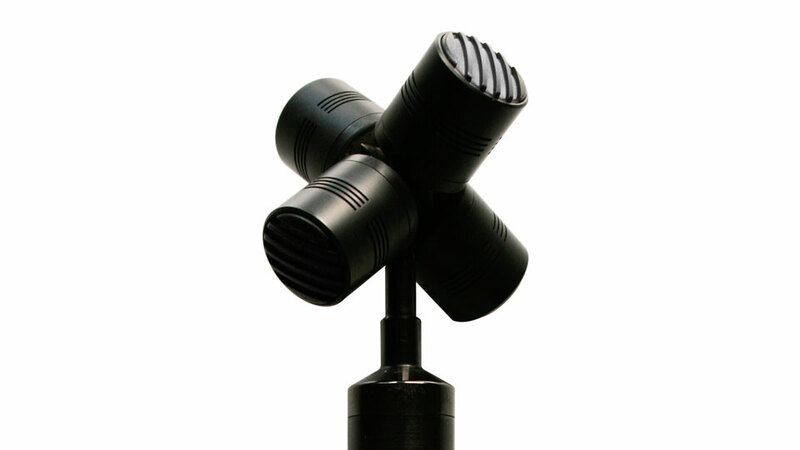 It is a type of Ambisonic that is used for VR movies and can be read by many players, including Youtube and Facebook. Without going too far into the specifics, the classical Ambisonic technique involves a recording with a mic rig consisting of 4 caps known as A-Format. This rig give you a signal that is called B-format. 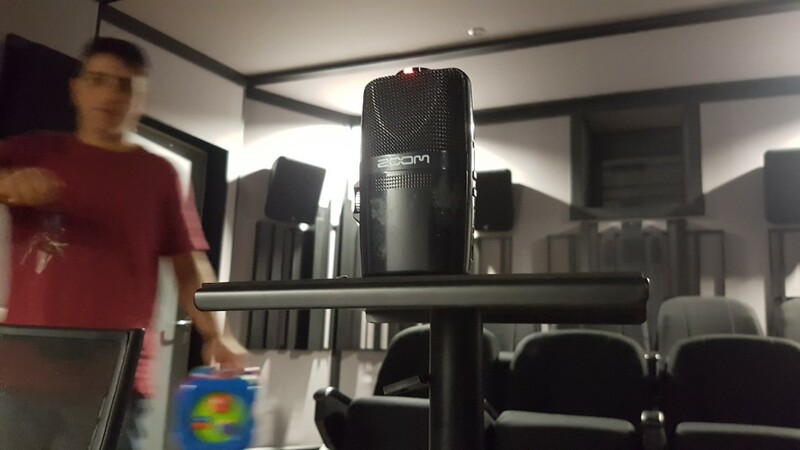 In addition to recording the audio information, the coordinates of the sound can also be coded in 360 ° space, both on the horizontal and vertical plane. The B-Format signal consists of four audio channels with the WXYZ nomenclature. The channels taken in their own way do not have any kind of value but, being correlated, if decoded with special plug-ins they can virtually return any type of usable format, from stereo up to 22.0 (if you want to exaggerate). 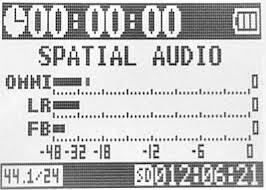 Zoom H2n in spatial configuration audio records a B-format signal that, unlike the one described above, lacks the Z axis (which is present as an empty track) and has the order of the WYZX channels as Ambix, instead of the classic B-Format WXYZ (also called FuMa). Anyone wishing to elaborate on the mathematical reasons for these differences can start from here. In any case, the fact of not having information on the Z axis limits this format to be decoded on planar space only, but to get a file in 7.0 is more than enough. The test I performed is very trivial and does not provide particular sound wonders. It is only intended to test the spatial performance of the small recorder. 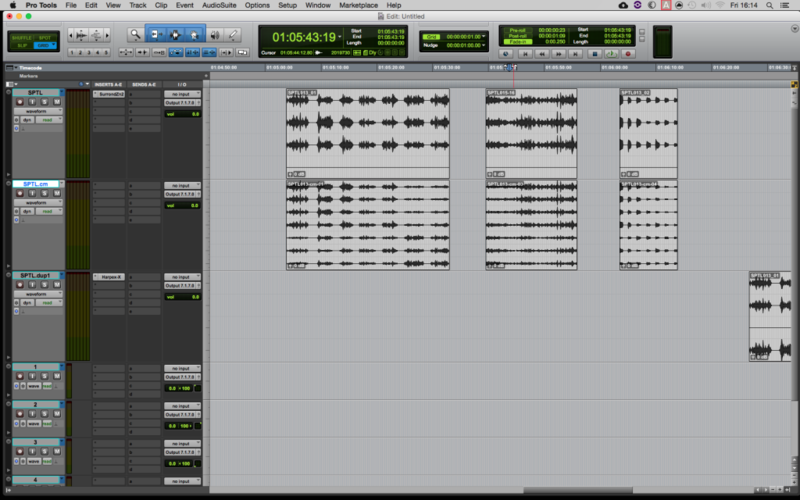 I made recordings very roughly with a bunch of keys and a toy for babies. Starting from the front of the capsule moving first to the left, then to the right, on the right side, on the left side, on the back left and on the back right. The H2n, of course, was set to “spatial audio” mode. 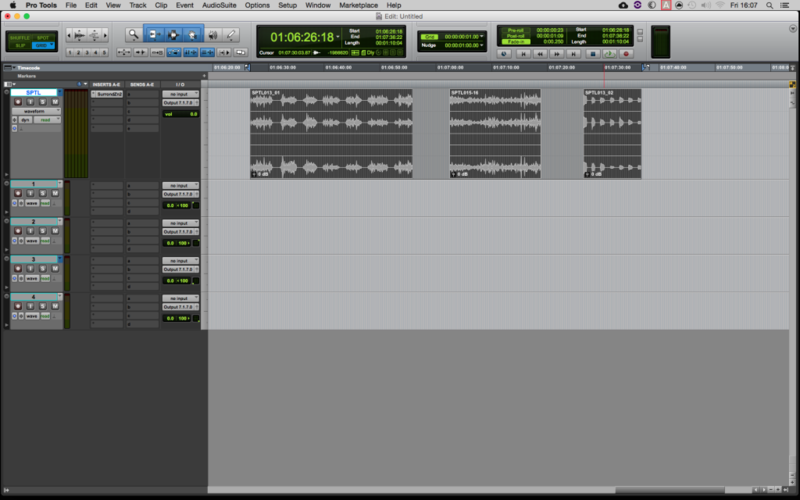 I imported audio files into Pro Tools, creating a Quad track. As mentioned above, it can be noted that the file is formed by the 4 WYZX sorted audio channels starting from the top, Z is empty. Before decoding from B-Format to 7.0 it is necessary to reorder the channels from WYZX to WXYZ. 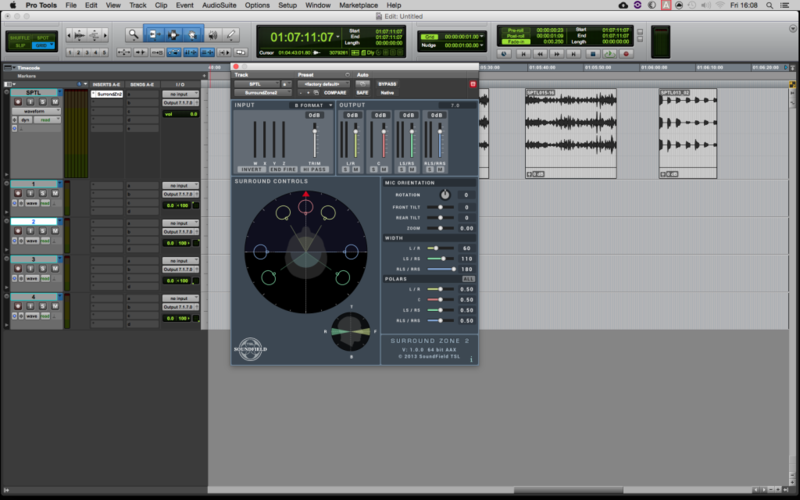 Just launch the “split to mono” command from Pro Tools and move the regions by hand. This is necessary because, wanting to remain faithful to the title of the post (low cost…) the decoding will be done with the Soundfield plug-in Surround Zone that is free and can be downloaded from here. The Surround zone only decodes files in the classic WXYZ order. Once the tracks have been inverted, they can come back to the quad track. There are other plug-ins able to directly decode the AMBIX order, for example Harpex, but it has a cost of over € 450 and is not really the “low cost” we aspire to in this case. You can change parameters to set the spatialization to your taste, in this case I left the default settings. Once you find the settings you like the most, you can record the decoded signal on another 7.0 track or launch the Pro Tools “commit” command and render the track. Although the test I performed is very approximate I must note that the performance of the small Zoom has passed the test. My impression is that it is very defined both on the front and on the sides, loses a bit of definition on the back that seems to be less placed in a specific place. You can check out, I leave you at the end of the post the links to download the files and a preview in Binaural to quickly listen the result on headphones. The last considerations that we have to make are about the general quality. The H2n like all handy recorders has a self noise that tends to be higher for reasons of miniaturization. So if you intend to plan high-level recordings you have to consider a whole different range of equipment and products. But, back to what is said at the top of the article, having the possibility to record in any context without being noticed creates the conditions to capture unique events. Every walla situations, restaurants, bars, but also public transportation or train stations where to enter with a cumbersome boom there is the risk of being mistaken for terrorists today. It is certainly better to have good compromise surround sound recordings in your hard drive rather than not having them. I also recommend using a windscreen for outdoor recordings. From here you can download the .ZIP file with the recordings made.